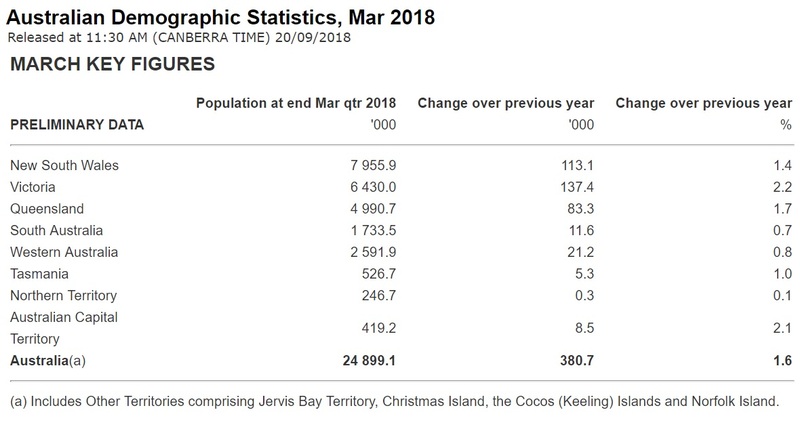 The preliminary estimated resident population (ERP) of Australia at 31 March 2018 was 24,899,100 people. This is an increase of 380,700 people since 31 March 2017, and 125,100 people since 31 December 2017. “During the previous four years, Queensland came second to Victoria in terms of net interstate movement, so these states have swapped,” said Mr Grubb. “Before that, Queensland was the biggest gainer for 20 years, excepting a brief period in 2011 when Western Australia overtook it. “The most common move between states was from New South Wales to Queensland with 52,000 people making the move north. The next most common move was in the opposite direction with 36,900 people moving from Queensland to New South Wales,” said Mr Grubb. Net overseas migration added 236,800 people to the population, and accounted for 62 per cent of Australia’s total population growth. Natural increase contributed 143,900 additional people to Australia’s population, made up of 307,200 births and 163,200 deaths. Melbourne had the largest growth of all Greater Capital Cities (125,400), followed by Sydney (101,600) and Brisbane (48,000). This was the first time on record that Sydney had a population increase above 100,000 people. Together, these three cities accounted for over 70% of Australia’s population growth in 2016-2017. Melbourne also had the fastest growth (2.7%), ahead of Brisbane and Sydney (both 2.0%). All states and territories experienced population growth between 2016 and 2017. 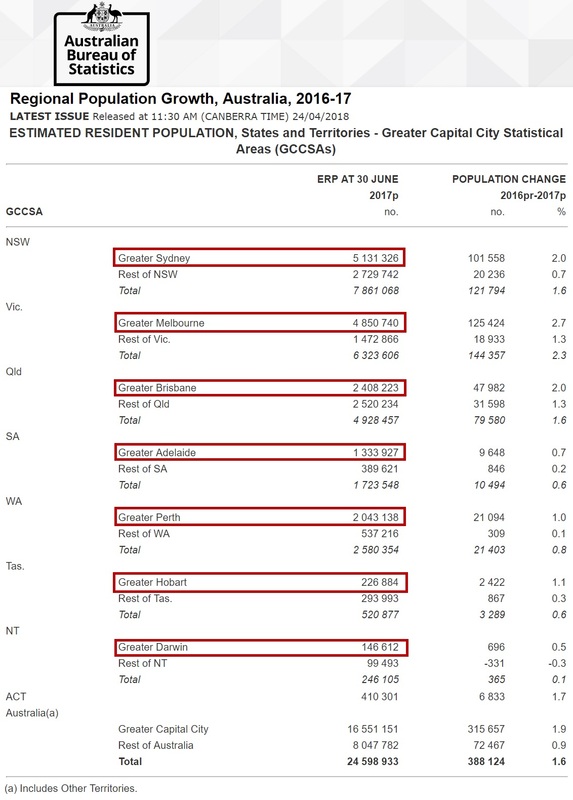 Victoria had the largest growth in terms of absolute numbers (144,400 people), followed by New South Wales (121,800) and Queensland (79,600). The Northern Territory had the smallest growth (370). Victoria also grew fastest (that is, it had the strongest growth rate), increasing by 2.3%, followed by the Australian Capital Territory (1.7%), New South Wales and Queensland (both 1.6%). The Northern Territory had the slowest growth (0.1%), followed by South Australia and Tasmania (both 0.6%), and Western Australia (0.8%).